For our Love Potions, romantic recipes, we’ve selected this Candy Corn Sugar Cookie recipe from our friends at Bake Space. 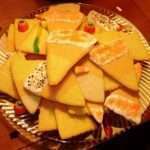 To celebrate Halloween, try this simple and easy recipe that is not only delightful to look at, but you’ll have fun nibbling on them with your next online date or at a Halloween costume party. Beat flour into cookie dough, then divide into three parts. Beat lemon zest and yellow food coloring into 1 part; set aside. Beat orange zest and orange food coloring into another part; set aside. Beat vanilla into remaining plain part. Roll each section into a long rope. Lay side-by-side on a lightly-floured surface, with the orange in the middle. Use a rolling pin to roll (lengthwise), forming one sheet of dough with three stripes – plain, orange, yellow. 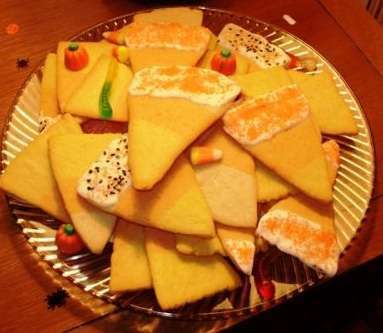 Use a knife or pastry cutter to cut into triangles. Bake 9-11″ and let cool for 1″ before transferring to rack to cool completely. Microwave chips for about 1″ to melt, then dunk some of the tips or backs into the chocolate and sprinkle with colored sugar.